A very inspiring movie based on John Carlin's book 'Playing the enemy'. 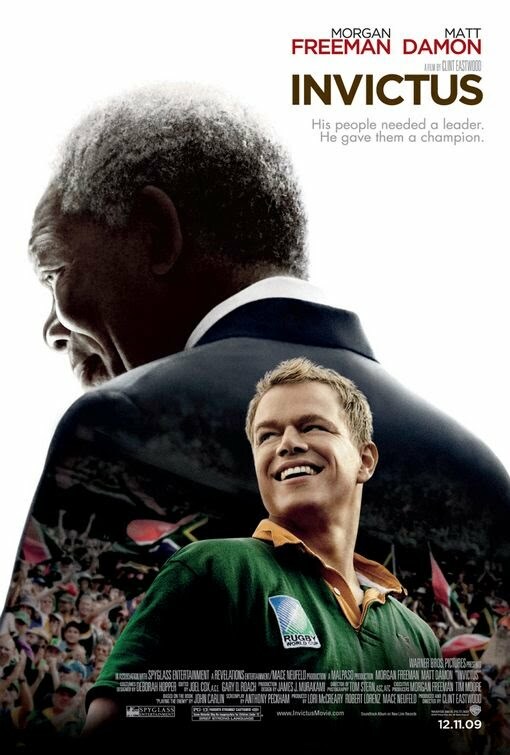 It was just a co-incidence that i watched this movie on Nelson Mandela's 92nd birthday. Directed by Clint Eastwood, Morgan Freeman plays the role of Nelson Mandela and Matt Damon as Francois Pienaar, the captain of South African Springboks rugby team. Nelson Mandela, soon after being elected as the President, marking the end of apartheid, tries to unite the country taking rugby as the vehicle to change, joining hands with the Captain of its team. South Africa finally wins the 1995 World cup against the mighty New Zealand. The movie ends with the words of the poem that kept his spirits up while he was imprisoned "I am the master of my fate: I am the captain of my soul".